Sakhar bhaat (Sweetened Rice) is simple and delicious Maharashtrian food at its best. It can be prepared for any special occasions and festivals. A bit of saffron and clove elevates the humble rice to a new level! 1) First Wash and cook the rice. Cook rice with enough water in pressure cooker .It should not be overcooked. 2) When the rice is cooked, gently spread it in a plate and let it cool. 3) Heat the ghee, when hot add the cloves and cook till the color of cloves starts changes (don't let them burn). 4) After that add Sugar and mix well for 2 mins. Then add the cooked rice when it is little bit warm only and mix well . 5) Add saffron / orange food color, cardamom powder, cashews. 6) Then cover and cook the rice for 7-8 mins on low heat. 7) When rice is fully cooked remove it in a flat plate. 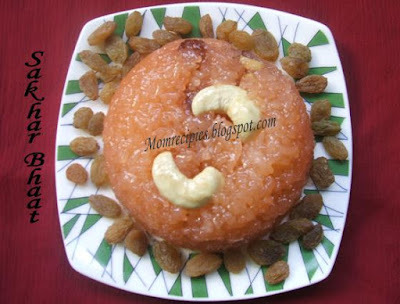 8) Serve hot or chilled, garnished with the raisins and the nuts. Note:- For 1 cup rice – 1 ¾ cup water. This is also reaching Shanti's 'Sweet time' Event. Wow tha tlooks so so yummy. I can imagine the sweetness in the ricce. wow.. new dish to me. lovely..we make only sweet pongal. this version is nice. This looks delicious and tempting! This sounds like a great dessert! Love the color! delicious rice nice color too sireesha. Delicious & tempting. Lovely sweet. Oh wow simply yummylicious....Awesome presentation....I think you can send this to Monthly Mingle-Rice hosted by Nags. i make this if I get bored of chakkaraipongal(jaggery rice)...looks yumm. This sounds very original and delicious as I don't know many desserts with rice. yours is the first dessert for the event :) thank you so much!! That looks so delicious - a new recipe for me. Sakhar Bhaat looks very tasty and rich.... Looks just like the once given in temples!!! Nice color!!! 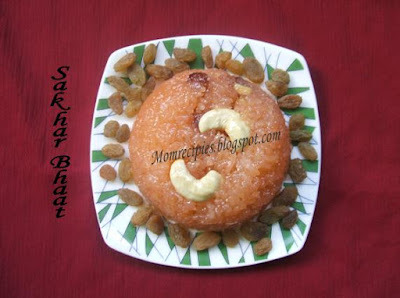 Sireesha, I haven't eaten sakhar bhath in ages, but it used to be a popular sweet in my home growing up. My mom would make it all the time, and it was delicious. Yours looks amazing.